Photography is a huge hobby of mine, and has been for some time. Not only is it a big hobby for all the Roth Brothers, Tom actually makes his living behind the lens. 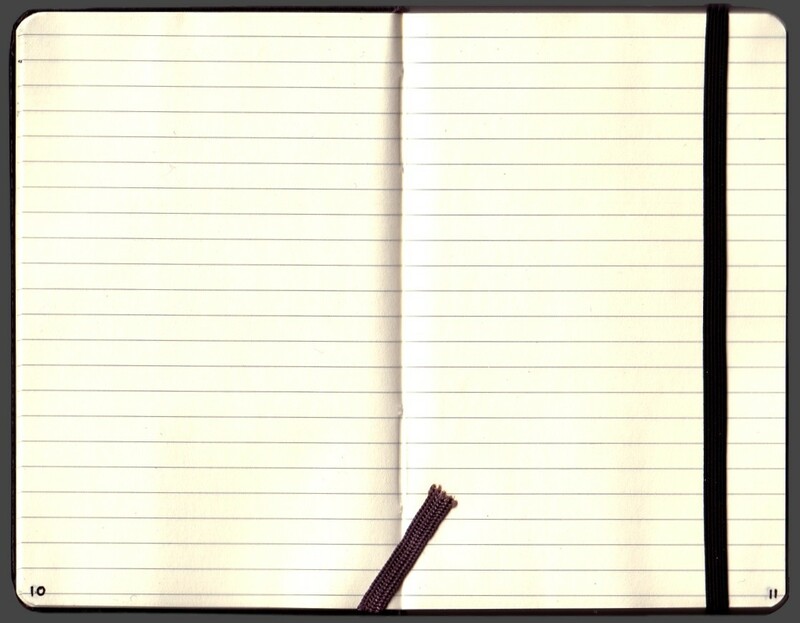 I think we all have Mom and Dad to thank for that (as well as our computer skills and music skills), because of the wise choices they made many years ago when we were young. As young kids, in the 1970s, we had various cheap cameras about the house. . . 126 and 110 Instamatics, nothing special. The Roths were not shutterbugs by any stretch, and our collective childhood went largely undocumented. 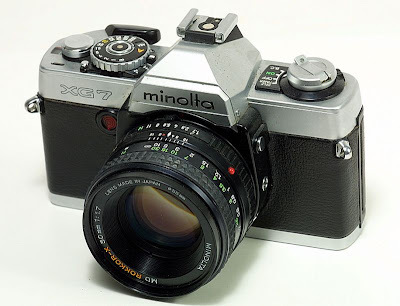 Until 1980, when in preparation for our six-week trip around the country, the folks bought a Minolta XG-7. It came with a 50mm kit lens, plus they bought a Sigma or Tamron Zoom, probably in the 70-200mm range. Not only did they get the camera, they also taught us how to use it, and let us take our own pictures. Granted, at that time our picture taking skills consisted of getting the shot framed, focused, and adjusting the aperture to try go get a 1/60 shutter speed (I don't know where that rule of thumb came from.) Dad was big on slide film, which added an extra step to the whole process. So a few years later, Andy and I ended up getting our own 110 Instamatics. . . with built-in flash! (Flash cubes and flash bars were very common in those days.) We wanted prints, 3.5" x 5"
We took decent pictures with those for a while, until probably in early high school, 1985-86 or so, Andy bought a Mamiya point-and-shoot 35mm film camera. Wow! forget 110 film. We couldn't even look at prints from those tiny 110 negatives after that. Of course, it was Andy's camera, so I was relegated to occasionally borrowing it, or the XG-7 when others weren't using it. 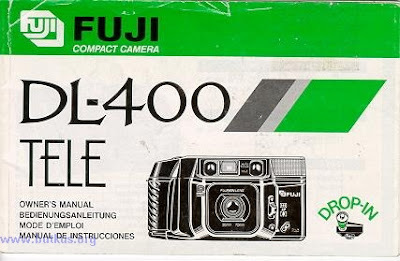 In 1990, after reading Consumer Reports, I bought a Fuji DL-400 point-and-shoot film camera from some New York camera store with an ad in the back of Popular Photography. I loved this camera. 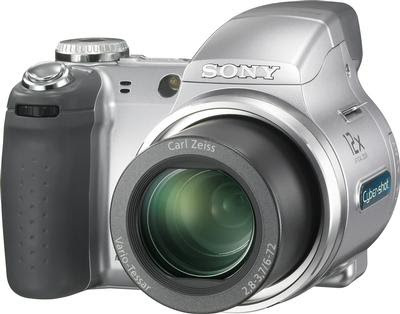 Not only did it have a zoom lens, it also had a data back for date imprinting, drop-in loading, and an LCD display. It did a fantastic job at metering, and nearly always got the focus right. Does, actually. I still have this camera. This is a great camera. It traveled extensively with Jennifer and me, and I have quite the collection of pictures with the inadvertent inclusion of its ubiquitous red camera bag in them. Camera bag in Mexico, Canada, Denmark, Greece, France. . . Even with the few "extra" creative controls it had, my photography skills eventually surpassed the abilities of the camera. Around the time Tristan was born (1998), it was time to move back to an SLR. 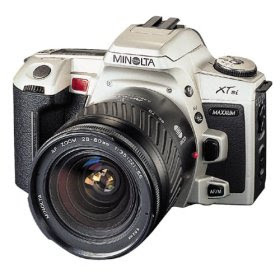 I'd been completely captivated with the Minolta Maxxum series of full-auto SLRs since the mid-80's, plus my experience with Dad's Minolta meant that I was going to be a Minolta guy too. I got a Minolta XTsi. The Maxxums were awesome. Not only could you do things like choose the shutter speed and let the camera choose the correct aperture to get the right exposure, you could choose the aperture and let the camera set shutter speed. You could do full manual and set everything yourself if you wanted to, or with the press of one (panic) button, you could instantly switch back to full auto, where the camera does everything. . . so you'd never miss a shot. You could even change lenses. I never got an additional lens, but that was once the plan. I really enjoyed this camera, and took many pictures that I'm still proud of. This camera went with us to France, Italy, and Switzerland, among many places in the US. Until digital photography became mainstream. I resisted going digital at first. I wanted to use my Minolta stuff on a digital camera, but nearly everything was point-and-shoot at the time. I was holding out for a DSLR with at least 5 megapixels that could use my lenses (lens, actually). But DSLRs were slow in coming. By 2004, I could hold out no longer. 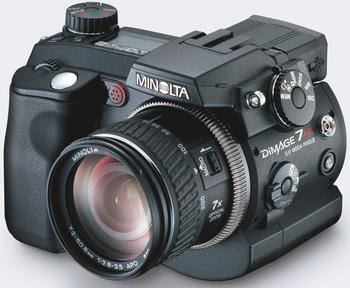 I went digital with the Minolta Dimage 7Hi. It didn't have interchangeable lenses, but it did a ton of cool stuff, plus the Minolta controls were very familiar. You could shoot full manual, partial automatic, or fully automatic, and still have the panic button to go back to full auto instantly. I really liked this camera, and slowly made the paradigm shift from being stingy with film shots to being liberal with digital ones. The camera had a few issues. . . it tended to overexpose, and the autofocus missed more than it should have. It really went through the rechargeable batteries, and it was also a lot to carry around at times. Plus with parts of the family being in different places at the same time, we needed a second camera. Based on recommendations of people whose photos I admired, we picked up the ultra portable Canon Powershot SD450. This camera is awesome! I wouldn't change a single thing about it. It takes great pictures, has long battery life, easily fits in your pocket for total portability, and has some fun features like color swap and Stitch Assist for building panoramic portraits. So it was the Dimage and the Poweshot for flexibility and portability. . . until the sensor on the Dimage went faulty, and the camera turned into a brick. Fortunately, Sony (the manufacturer of the faulty sensor) agreed to replace my camera, despite it being way out of warranty. This camera lacked a few cool features of the Dimage, but added a few others. It has a tremendous lens. . . over a 400mm equivalent (in SLR terms), does a great job of metering and focus, and runs on half as many batteries. It also has one additional megapixel. It gives the shooter plenty of creative control. And other than a warranty repair for a faulty shutter release button that kept the camera out of my hands over Christmas, this camera has been great. I started sharing my photos on Zooomr last year, and with all the interaction with some great photographers, and the awesome sense of community there, my photography skills, as well as my passion for photography, have increased dramatically. But once again, my skills have surpassed the abilities of the camera. Both Andy and Tom have been shooting DSLRs for a while now, and they've kindly let me use their cameras on occasion. I was growing increasingly frustrated at my inability to get the shots I was picturing in my head due to the limitations of my camera. I knew a DSLR was not far off. Then in March of this year, the possibility of a trip to Korea became a reality. This is a once-in-a-lifetime trip, and I knew how much I would regret not being able to get the pictures I knew I was capable of taking because I didn't have the right camera for the job. We're also planning a family trip to Africa next summer. . . another once-in-a-lifetime trip. A DSLR was quickly moving up the priority list. Based on my experience with my Powershot, plus the recommendations from Tom, I knew I wanted a Canon. I was looking at the Digital Rebel Xti for a while. 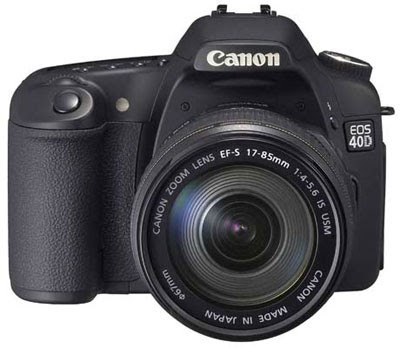 . . until a month ago when the Canon 40D was released. This was a camera that could do everything I needed it to to get the pictures I have in my head, plus it's flexible enough that I'm not going to outgrow it anytime soon. I took the plunge last Thursday, and bought my Canon EOS 40D, with the 28-135mm Image Stabilized lens, also on the recommendation of Tom. The issue du jour is, because this camera model is brand new, and very popular, many retailers are having trouble keeping it in stock. I ordered mine from Ritz Camera, (where Dad's XG-7 came from, coincidentally) initially, but when they couldn't even tell me when it would ship, I ordered from ProFeelVideo, and canceled the Ritz order. ProFeel said they could ship the body immediately, and the lens would ship the next week. So I ordered the camera kit on Thursday, and the body arrived Monday. This was maddening because I had this awesome new camera that I couldn't do a thing with, other than set the clock, due to my lack of glass. (We photographers don't say lens, we say glass.) I'm pretty comfortable that the kit lens will arrive before I leave for Korea on October 5th, but just to hedge my bets, I bought what would've been my second lens anyway, a 50mm 1.8 prime, used, on eBay. It arrived Tuesday. Also arriving are a spare battery, filters for the good lens, and a replacement GPS datalogger for the one I lost in Las Vegas. So now my mission is to get up to speed on using the camera as quickly as possible, since I only have a little over a week before I want to be taking shots that count. I constantly have a photography book or camera manual in my hand, and I've been using the kids' soccer practices to fire as many frames, with as many different settings as I can muster, in hopes of really knowing how to make the camera do what I want it to. I've even let Tristan and Zoe start taking their own pictures with it, and learn how to frame and focus (aperture and shutter speed are handled by the camera. . . for now.) You're never too young to start a lifelong passion for photography.